Welcome to Not Me! Monday! This blog carnival was created by MckMama. You can head over to www.mycharmingkids.net to read what she and everyone else have not been doing this week. This is NOT my foot! I have wanted at tattoo for many years now, but I did NOT decide on my last night at the beach to go ahead and get one. I would NEVER do something so permanent!! 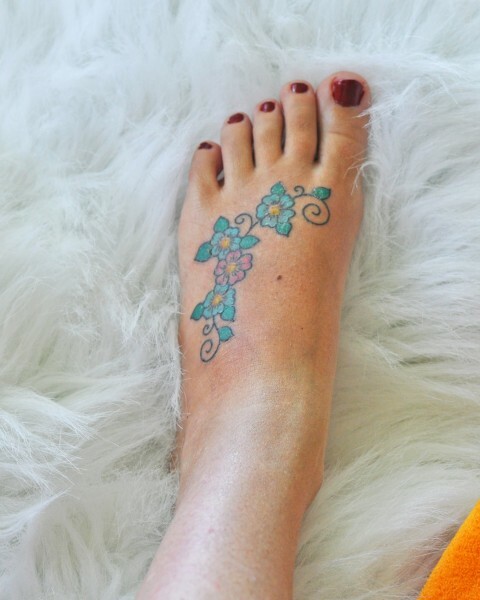 It is purely coincidental that the tattoo in the picture has 3 blue flowers and one pink. Even though that would work perfectly for my 4 kids, that is NOT my tattoo!!! Getting a tattoo would be crazy! That is why I, an almost 36 yr old mother of four, would NEVER get one! Nope, NOT ME!!!! I would never act like I was throwing a baseball and trip over the sofa in the tattoo parlor. Nope, NOT ME! as you may know very well than me these days blogs are cropping up all over the place.most peolpe starting such blogs think,they can write anyway and anything on there blog which is definately not true.but your blog solely stands out for your writing style,it is actually quite engrossing.keep at it.